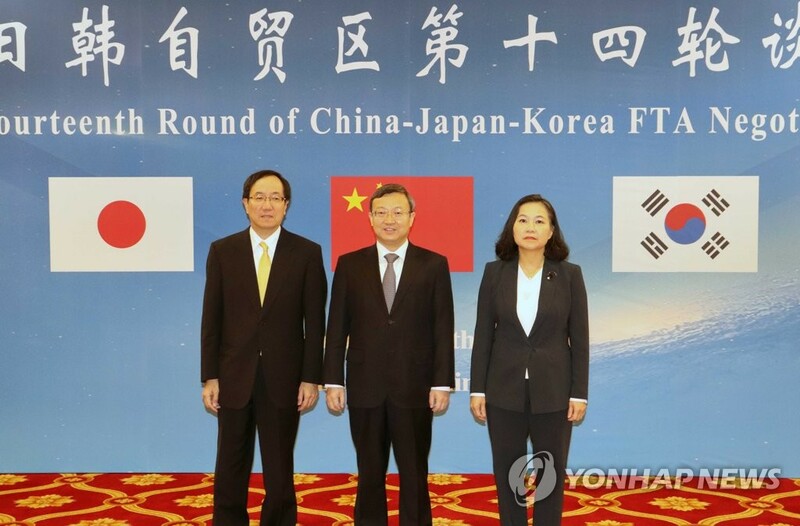 (SEOUL=Yonhap News) Senior trade officials from South Korea, China and Japan will hold a fresh round of talks this week on forging a free trade deal among the three Asian neighbors, Seoul's trade ministry said Monday. Since launching the talks in late 2012, the three nations have made little headway toward a deal that, if successful, would create one of the world's largest economic blocs. This week's talks, the 15th round of negotiations, will be held starting Tuesday for four days in Tokyo, the Ministry of Trade, Industry and Energy said in a statement. Trade officials are expected to discuss ways to open goods and services markets and lower other trade barriers, according to the ministry. Yeo Han-koo, South Korea's chief negotiator to the negotiations, urged China and Japan to show "flexibility" to move a deal forward. The talks come as China is seeking to strike trade pacts with other nations amid rising pressure from the United States. The three Northeast Asian nations are members of the Regional Comprehensive Economic Partnership (RCEP), a mega trade deal involving 16 Asian nations. RCEP is, in essence, a massive regional trade deal between the 10 members of the Association of Southeast Asian Nations (ASEAN) and the six countries with which ASEAN has free trade agreements -- South Korea, China, Japan, India, Australia and New Zealand.